Pictured (Left to right): Beril Ismail Sezmis and Trevor Tapping from 3D Technologies, Jane Talbot, centre manager at the Warwick Innovation Centre, Alan Rock and Eduard Kriegler from 3D Technologies. A revolutionary new tool that will change the way that people accurately measure is set to be launched by a Warwick company. The Moasure ONE is a new product that has been developed and created by 3D Technologies. Described as the world’s first motion-measure, the ground-breaking piece of equipment accurately measures volume, area, circumference, height, angle, level and more by simply moving. 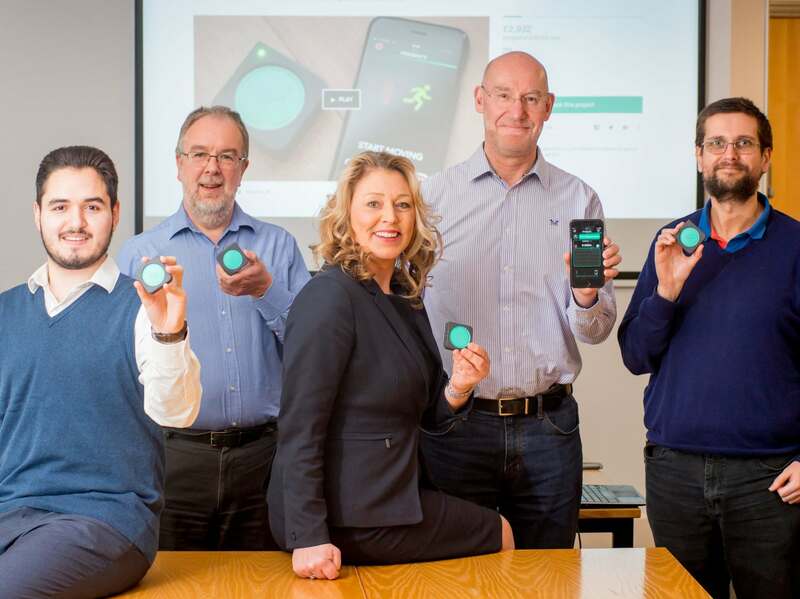 Based at the University of Warwick Science Park’s Innovation Centre in Warwick, the firm has been developing the product since it first began in 2014. Following on from the success of their Moasure smartphone App for both iOS and Android, the company has now launched a Kickstarter campaign for the Moasure ONE. The ONE not only increases the measurement accuracy of the App, it also adds a further 20 ways of measuring. Within the first 24 hours the campaign had reached 35 per cent of its target, and it is expected that more people will come forward and see the potential in the project. Alan Rock, 3D Technologies founder and CEO, said there are no other devices like this available around the world. “The Moasure ONE really is the first of its kind, there are no other devices available that are capable of measuring like it,” said Alan. “I first came up with the idea for motion measuring back in 2002, but I needed to wait for the technology to catch up with the idea. “Motion measuring is the technology used in rocket guidance systems to keep track of movement in 3D space. Moasure uses this same technology to take and calculate precise measurements. “Moasure started as an app for iPhone and Android phones, but it’s accuracy was limited as we had to use the technology that was installed on the phones. But we are taking it further with a physical tool that will work with a phone. “We will start shipping in November and it is a product that can be used by tradespeople from plumbers to estate agents and for those doing DIY around the home. Packed into a measure that fits in the palm of the hand, powerful motion sensors propel Moasure ONE to a level of accuracy and versatility that can’t be beaten by lasers, GPS, or camera-based apps. 3D Technologies, which has a team of nine, has been based at the Warwick Innovation Centre since it first began and was offered assistance by the University of Warwick Science Park through its Ignite programme. The company has also been supported by the Business Ready programme, which is delivered by the University of Warwick Science Park and is part of the Coventry and Warwickshire Business Support Programme. This programme is partly-funded by the European Regional Development Fund and Warwickshire County Council. Jane Talbot, centre manager at the Warwick Innovation Centre, said: “3D Technologies has gone from strength to strength over the years and it has been incredible to see. “It is exciting to see the hard work of the team come together with the launch of their new product imminent. For further information about the Kickstarter campaign and the Moasure One visit https://kck.st/2FWwo0p or www.moasure.com.